If you haven’t seen La La Land you might be confused by what all the noise is about. It’s won seven Golden Globes, been nominated for eleven BAFTA awards and is one of the bookies’ favourites to sweep the Oscars. But the thing is, it’s a musical, and previoussinging in all her glory, and the classic MGM musicals of the 1950s, where anything can happen and the world is just a playground for the story. It cheapens the film to call it a musical, though, because it’s a romantic film, too, where Sebastian (Ryan Gosling), a struggling jazz pianist, and Mia (Emma Stone), an aspiring actress, meet, fall in love, and push each other to achieve their dreams. But don’t mistake this film for nostalgic or soppy, as the relationship feels real and the film dismisses nostalgia itself. So it’d be easy to mistake director Damien Chazelle’s attempt to modernize the musical as a failure, but it isn’t. Chazelle has managed to take all the best moments out of all the best musicals and has placed them in LA, where he writes the most realistic, most heartfelt musical ever done. And every scene is perfect, there isn’t a shot that isn’t perfect. Chazelle has captured everything in detail from the awe inspiring choreography to the ecstatic surreal dancing of the people of LA. He does it so well that it’s hard to look at the film fairly because it captures the very essence of cinema. Watching Ryan Gosling and Emma Stone sing City of Stars is as iconic as Robert De Niro talking to himself in the mirror or Gene Kelly twirling around a street lamp. So what exactly is La La Land? Well it’s the best movie of 2016, perhaps of the 2010s. 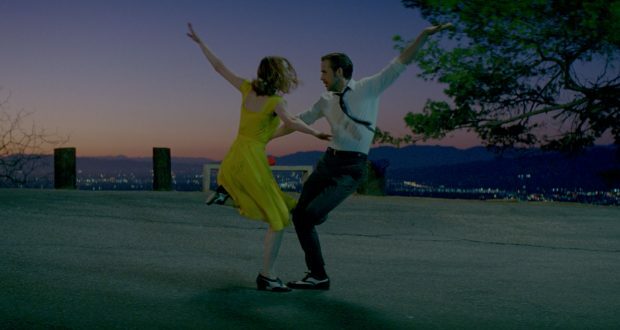 It’s a thrilling romance, a titillating comedy, and a eye-watering drama, all at the same time, one that could only exist in a completely La La Land. If Damien Chazelle doesn’t win Best Director at the Oscars I’m going to break into the winner’s house and steal it so that Chazelle can have what is rightfully his.